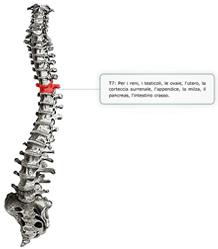 Spondylolysis: an interruption or defect of the pars articularis of the vertebra. 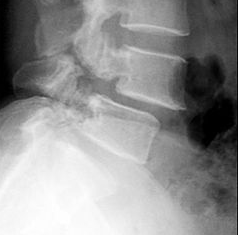 Spondylolisthesis: anterior displacement of a vertebral body in relation to the segment immediately below. 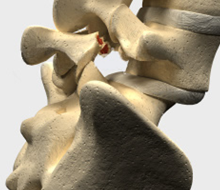 There are several types of spondylolisthesis; however, the most common types are isthmic, occurring in the young, and degenerative, occurring in older patients. Approximately 90% of all spondylolytic spondylolystheses involve the 5th lumbar vertebra. The remaining 10% are found throughout the lumbar and cervical vertebrae. is secondary to long-standing degenerative arthrosis. It is without separation of the pars. In addition to the many unanswered questions regarding the causes of spondylolysis and spondylolithesis, there is also controversy over the clinical significance of this common finding. This is mainly due to the fact that spondylolysis and spondylolithesis can be found in symptomatic or asymptomatic individuals, and there is no correlation between the degree of anterior displacement and the severity of symptoms. In fact, it is quite common to observe individuals with severe displacement, and only minimal or no back pain at all. Dr. Morrison has extensive training in radiology and bone pathology and is adept at differentiating the actual causes of patient symptoms. The vast majority of spondylolysthesis patients find significant benefit with Chiropractic therapies because they are designed toward creating and maintaining proper alignment of the pelvis and vertebral column. In addition, the techniques of Applied Kinesiology are unparalleled in reinforcing the pelvic-stabilizer muscles - a necessary part of maintaining lasting results.